Upcyling discarded items can be fun and inspirational. Bottles come in all shapes and sizes, each having a potential to become a work of art. For example this small men’s cologne bottle felt just right for my Angelic bottle. 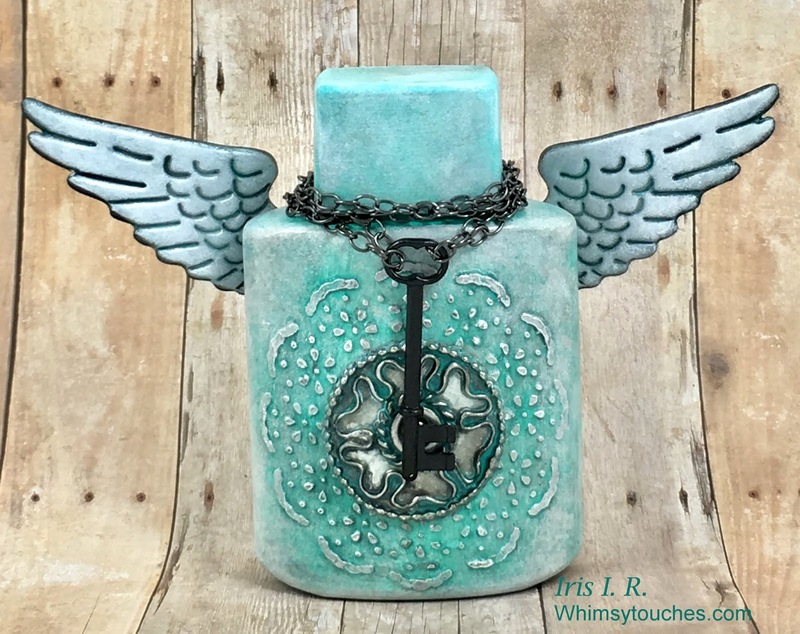 I used Canvas Corp Brands goodies; High Impact paints, Architextures wings and center adornment and 7gypsies skeleton key. Check out my tutorial. Gesso the bottle. This will help the paint to better adhere. Stencil the pattern with Liquitex Modeling paste. Paint one layer of the White High Impact paint. Paint one layer of the Aqua High Impact paint. Lightly sponge one layer of the white paint on the raised areas. Paint a layer of the black paint and wipe off the paint from the raised areas, ensuring to leave paint in the crevices. 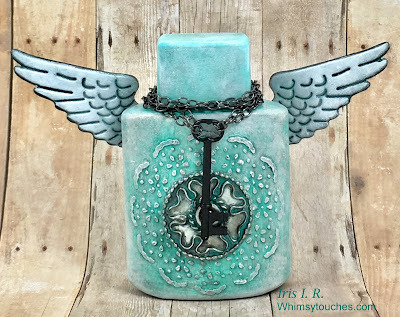 Before adding the key and wings, seal the bottle, so that the paint does not scrape off. You can use spray sealer like Krylon or 3M or use a water based varnish or polyurethane. Add the key and chain and glue on the wings.